They’ve got the right idea, these monkeys. It is so cold outside – below freezing – and I’ve lost feeling in my toes. 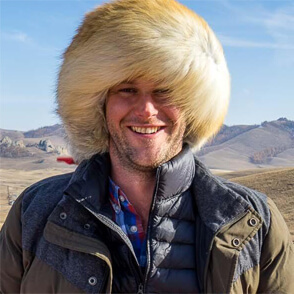 I’ve got on three layers of clothes – two of them wool – and the warmest woolen hat I have. Yet still I can feel the icy air cutting at me. Oh, how I wish I was in that steaming onsen with its natural hot waters. I guess we’re quite alike, the monkeys and me. It’s strange to think that animals would have the same reaction to the cold as humans. Normally you think of native animals that have adapted to their surroundings and act like… well, animals. Sure, penguins in Antarctica might huddle together but they’re not building igloos. 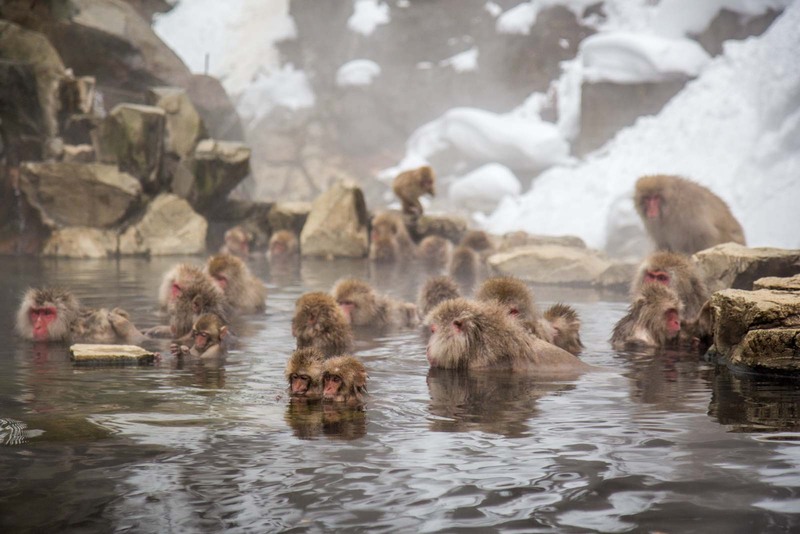 That’s why it’s such a strange sight to see these Japanese macaques (or snow monkeys, as they’re also called) doing exactly what the Japanese people do in the winter – soaking in a natural hot spring up in the mountains. 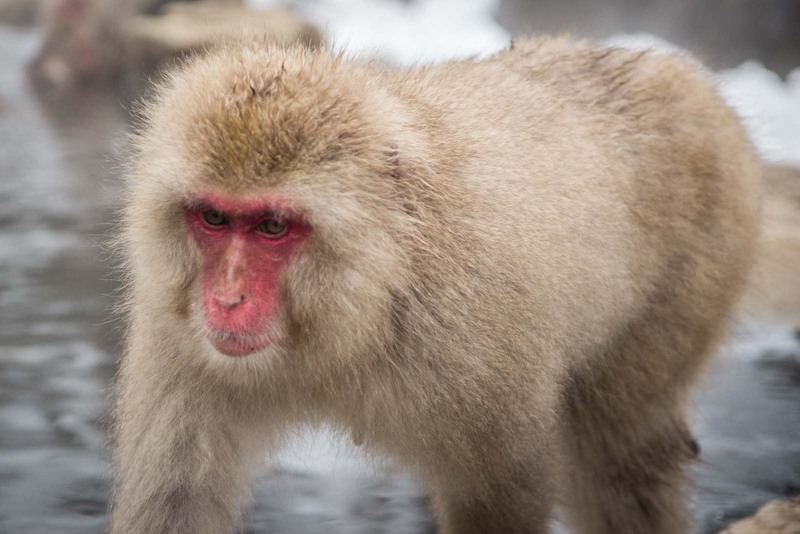 And you can understand why it brings plenty of visitors here to the Jigokudani Monkey Park near Nagano each year. There’s definitely something very cute about the whole scene. But I find it a little bit unnerving too, I have to admit. It’s got a touch of ‘Planet of the Apes’ about it. 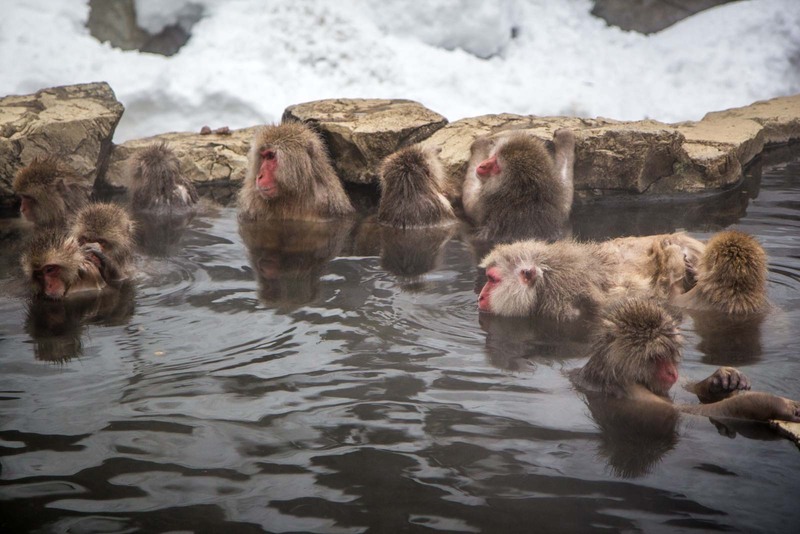 It’s almost as though these cute little snow monkeys are becoming more like us humans by using the onsen – maybe at a rate we don’t understand. They show no shame or humility about that either. 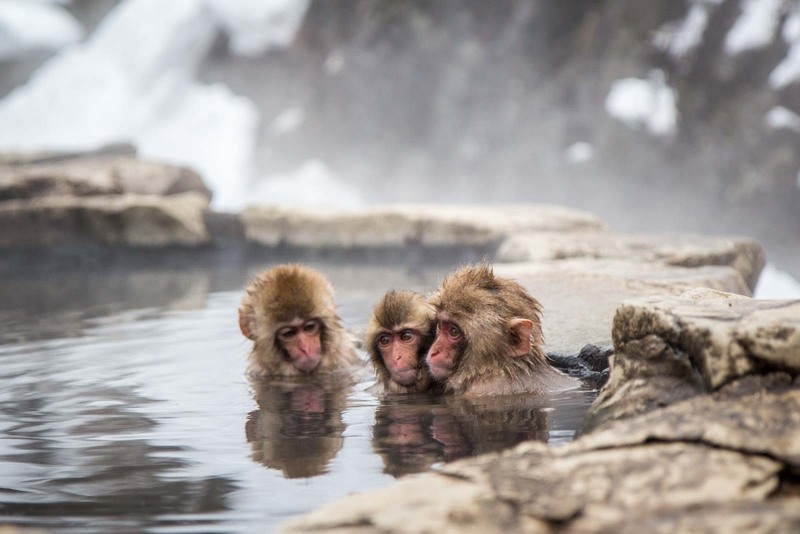 As I watch them, the macaques just stare casually back at me and relax even more into the hot water, giving a look that makes me wonder if they know something I don’t. Perhaps about a monkey revolution that will start at any moment. There’s no snow coming down right now at Jigokudani Monkey Park but the landscape in every direction is white from the latest fall. There’s a fast flowing river running through a ravine and the onsen is perched about ten metres above it, on somewhat of a cliff. The slope continues up even further and monkeys are running all over it. The water in the hot spring is about 42 degrees Celsius – perfect for keeping warm in these icy conditions. 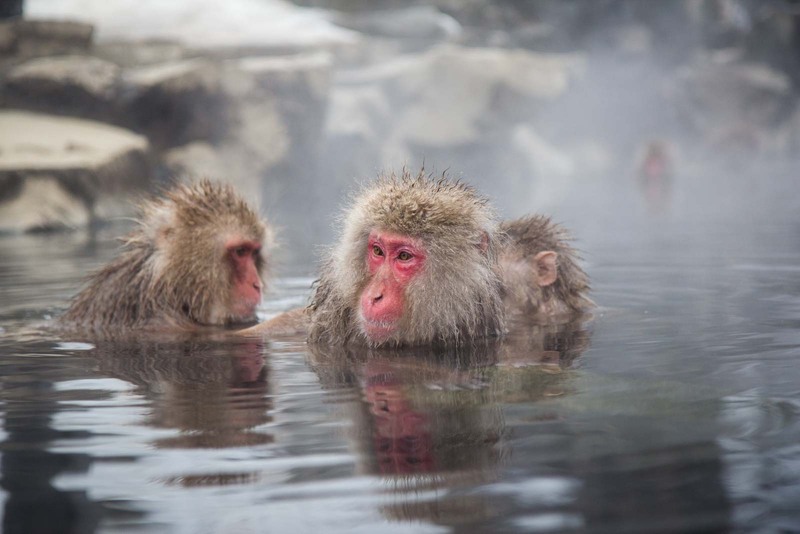 But the monkeys can easily survive without it and seem to use the onsen more for comfort. Some of them will sit in the pool, while others will spend most of the day running around the mountain, climbing in the forest or hanging on the river bank. At night they all head for the trees and sleep on branches in the forest. The next morning, after waking up at dawn, they forage for breakfast and then make their way back to the hot spring area. 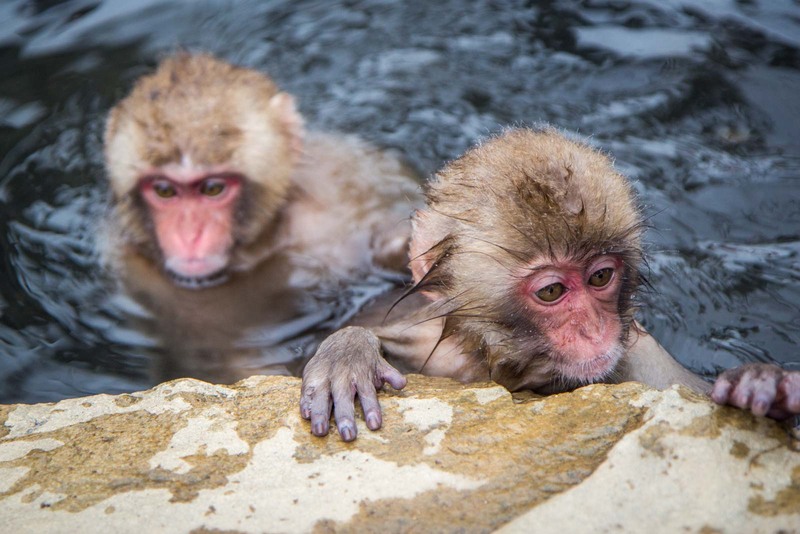 The snow monkeys have a routine during these cold winter months and I imagine they’ve got used to each day involving humans. There is a decent sized crowd of visitors at the onsen for the hour that I’m here but it’s never so large that it’s annoying. Perhaps the numbers are controlled somewhat by the two kilometre walk along the icy forest path that is the only way to access the site. You wouldn’t want there to be too many more tourists here, though. The onsen is actually much smaller than I imagined – about the size of an average backyard pool – and you can only stand around half of it. 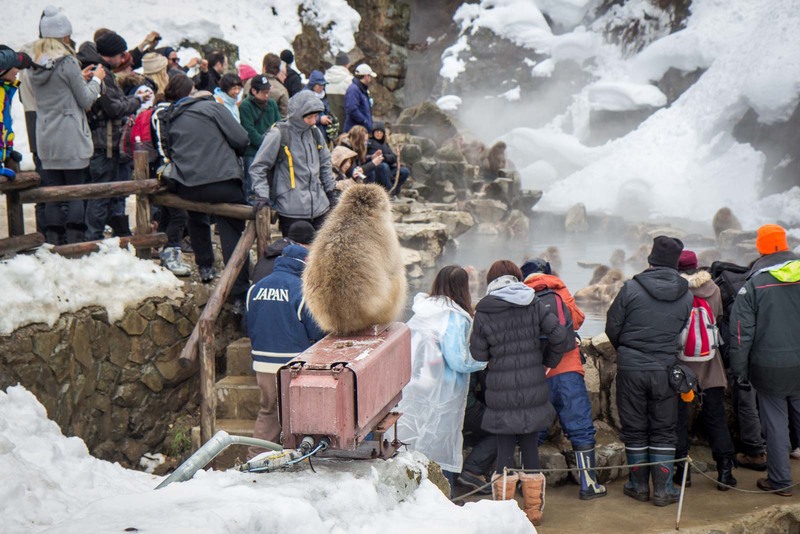 It means there are limited spaces to get a clear view or photograph of the snow monkeys. But, if you have one of the front row spaces, you will be face to face with these cute (potentially revolution-scheming) animals. They will come right to the edge and then pretend to ignore you, they’ll jump over you from behind when they’re coming back to the pool from a hillside excursion, and they’ll even – as happened to me – roll right over your feet while they’re fighting each other. And they know how to pose, these monkeys. From the tiny babies with their big innocent eyes to the alpha males who close their eyes and throw their head back in ecstasy, the faces of the macaques are so expressive. I am taking far too many photos because there’s a constantly changing performance on stage in front of me. Although, of course, the animals are probably not doing this for our benefit. They seem so disinterested in us, we might as well be rocks. I could stay here and watch them for hours but I fear my toes may soon fall off from the crowd. It’s with some reluctance that I eventually head back towards the forest path and away from the onsen. As I stamp my feet and clench my fists to get the blood pumping, I think about the evening ahead. There’s a good chance it’s going to include an onsen. I guess we’re quite alike, the monkeys and me. And I still find that a bit unnerving. Where is the Jigokudani Monkey Park? When is the Jigokudani Monkey Park open? How much is the Jigokudani Monkey Park? How to get to the Jigokudani Monkey Park? It is possible to get to the Jigokudani Monkey Park by public transport. The best options are to either cath the Nagano Dentesu Bus for Kanbayashi from Yudanaka station, or the Shiga-Kogen Line of Nagaden Bus from Nagano station. 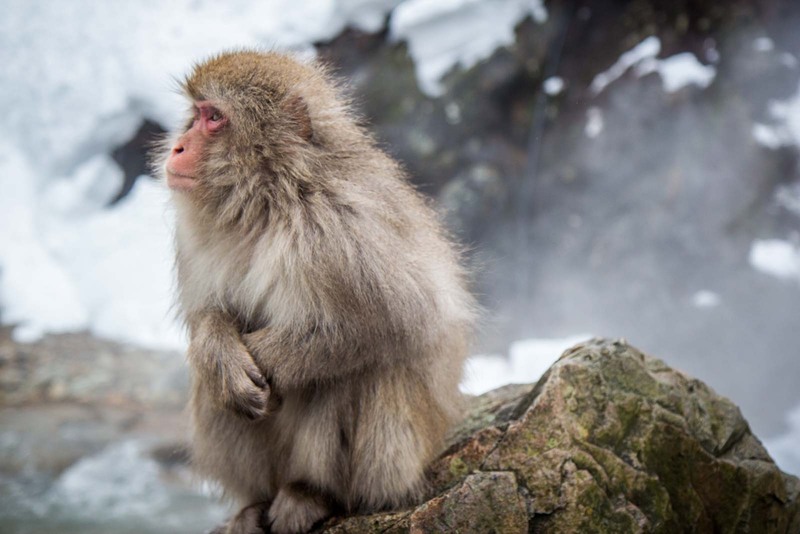 You can visit the park during the summer months and you'll be able to see monkeys - however, don't expect them to be in the onsen if it's warm weather. You can find out more information here about the Jigokudani Monkey Park. Time Travel Turtle was a guest of the Japan National Tourism Organisation but the opinions, over-written descriptions and bad jokes are his own. I really loved it there when I went years ago. Although there was a snowstorm and it was freezing cold, I stayed for hours and took way too many photos. Luckily there are some nice onsen nearby where you could soak in and warm up again. 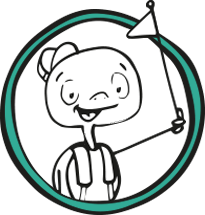 I know – super cute! I thought they were going to be evil because of the red faces but then they were just lovely to watch. I was hesitant to visit the onsen during my next visit to Japan in March but now I know I HAVE to go. Wonderful photos, Michael! Oh yeah, it’s definitely a must see! It wasn’t quite what I was expecting – a bit smaller – but there was a lot more action and things to see than I thought, so it really lived up to the hype! The writer is a moron. The monkeys here have probably been doing this long before humans even found the hot springs. Why is seeking warmth during the cold so ‘unnerving?’ I almost expected the writer to find it ‘unnerving’ that they were scratching themselves just like the writer when he had an itch! OMG! It’s the Planet of the Apes, people… they’re taking over! I just wonder, how they cope getting out into the freezing cold after their bathtime and still being wet? They don’t seem to mind it (certainly not as much as I would – brrr!!). They don’t need the hot water to survive – it’s just for comfort. So I guess it’s just like when we get out of a hot shower on a normal day. We loved spending time with the monkeys and it was so great to see them free. There were a few annoying tourists there who were trying to piss monkeys off for a photo. Great to see you included a photo of the pool with everyone around it. You never see that until you get there. I’m glad you appreciated that wide shot! I almost didn’t include it because it ruins the ‘magic’ of all the other photos. But the size of the pool and all the tourists around it really surprised me so I wanted other people to know what to expect. Not that it takes away from it at all. Wow this is amazing Michael – thanks for sharing! Seems they are the world’s most innocent monkeys. Its a worth visit. Its just one needs to be careful while reaching the park as the ground is too slippery. the tourists are watching them, freezing in cold .